ALAMEDA – Raiders head coach Jack Del Rio gives his players Monday off. Tuesday is generally an in-season rest day, but the Silver and Black get the day after a game to be away from the facility. "There's some raw emotion on the day after the game, so I think that helps you maybe teach a little better," Del Rio said in his Monday press conference. Things need to be taught. That's one of the biggest benefits to the structure." Del Rio called this a "miserable Monday," where his team will be widely criticized for a disatrous 27-10 loss to Washington. They'll spend one more day reviewing it during what Del Rio dubs "Tell the Truth Tuesday." It won't be terribly fun, especially after getting outplayed and outcoached. It's a day for corrections, development and one last look back before pouring focus forward the Denver Broncos. The Washington loss only counts as one. It can become two if that game's hangover lasts all week. Del Rio is good keeping his players locked on the next task. He'll also have to keep them from pressing like they did in Washington. "We were really looking for that spark, probably pressing early in the game," Del Rio said. "Offensively, we got out of rhythm. We threw, in the first four drives, two picks and two three-and-outs. We weren't in rhythm, obviously. They executed. It really wasn't anything overwhelming. They played some solid, basic coverage and we didn't execute and they did. It's just one of those days. It's an opportunity to learn. Recognize what went wrong." Explaining what went awry will be key this Tuesday. There was a lot. Quarterback Derek Carr tried to put the team on his back, to no avail. Carr had a rare dud, and took full responsibility for the loss after the game. "That's good for all of us," Del Rio said. "To me, that's what we need to do. It starts with me, obviously there are a lot of things that each guy can look at and say ‘this is what I can do better.' That's what I want. I want us to reflect inward and see how we can do things ourselves better and then pull together as a team. Stick together, pull together and go forward. That's what you do." Receiver Michael Crabtree took a big hit to the chest from Montae Nicholson on Sunday night and did not return to the game. That leaves his availability in some question. "We'll take a close look at him and make sure there's nothing significant going on," Del Rio said. "I know the doctors cleared for him to travel with us coming back which was good. He took a good shot. It was a clean hit, a good shot. Crab's a tough guy so I'm sure he'll bounce back." Raiders lead running back Marshawn Lynch only touched the ball seven times at Washington. He had six carries for 18 yards and an eight-yard catch. That isn't enough for this Raiders offense to function well, but Sunday was a unique circumstance. The Raiders fell behind early and couldn't sustain drives. 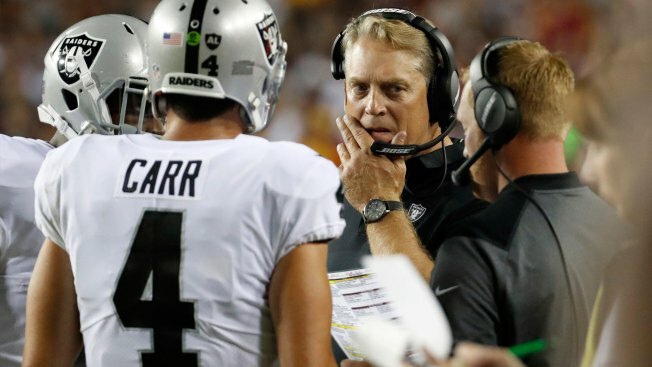 "When you have as many three-and-outs and you only take 50 snaps of offense, you can talk about all the things that you left on the drawing board that you would have liked to have gotten to," Del Rio said. "Certainly, there was a lot of offense that we had designed to get to, including touches for him, but 0-for-11 on third down says all you need to know. When you're talking about, does your running back get a chance to run it as much as you'd like, when you're 0-for-11 on third down you're not going to get a lot of opportunities anywhere with your offense."